Step 1: In a medium bowl stir together ketchup, honey, soy sauce and garlic. Set aside. Step 2: Lightly season the pork chops on both sides with salt and pepper. Brush each chop with the sauce to coat. Step 3: Grease the grill grates of an outdoor grill and heat the grill to medium-high heat. 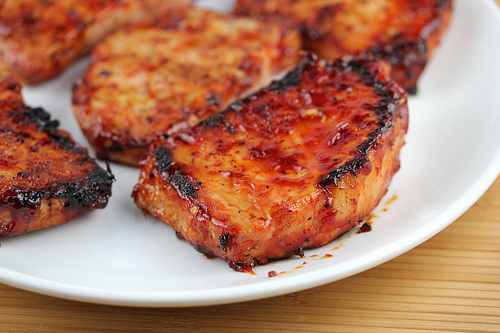 Place pork chops onto the grill, and cook (while basting with the sauce often) for about 5 minutes on each side or until the meat is cooked through.